Do you have trouble sleeping at night? Do you or your partner snore loudly and frequently? Are you woken up several times throughout the night? Even when you feel you’ve gotten a full night’s rest, do you still wake up feeling exhausted? You might be one of millions of Americans suffering from sleep apnea. 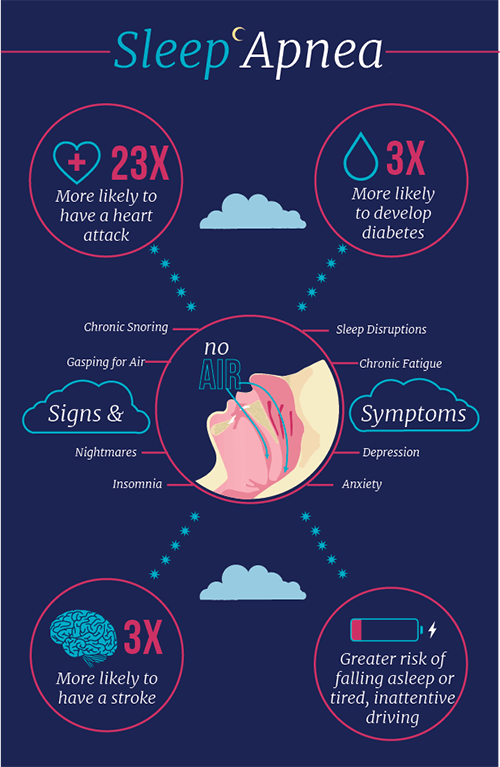 Obstructive sleep apnea is a common chronic disease afflicting millions of Americans, many of whom are unaware of their condition. It occurs when the soft tissues in the back of the throat collapse at night during sleep, preventing air from passing through, and actually stopping your breathing altogether. The most common treatment for sleep apnea that doctors prescribe is a CPAP machine. This is a device that you wear during sleep that looks a bit like an oxygen mask, that provides continuous air pressure to prevent the airway from collapsing. While this is an effective treatment method for some, many patients find the device intolerable – they simply cannot sleep wearing the device. That’s where we come in. Dentists are in a unique position to treat patients suffering from sleep apnea. We can provide you with a custom mouth guard that you wear during sleep that repositions the jaw, preventing the collapse of the airway and allowing for restful sleep and healthy breathing. We can help you get back your sleep, and your life with sleep apnea treatment. If you have any questions about sleep apnea, or would like to schedule a consultation with your Lexington dentist, Dr. Brewer at Brewer Family Dental, please contact our office today at (859) 554-4799.